Mix the batter ingredients together, and put to one side. Put 50mm of sunflower oil into a baking tin, then place this on the middle shelf of your oven at his highest temperature (240°- 250°C). Place a larger tray underneath it. When the oil is very hot, add your sausages. Allow them to colour until lightly golden. 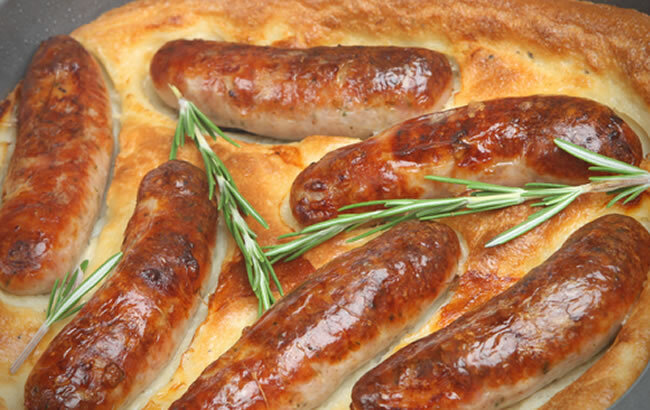 Take the tin out of the oven, and pour your batter over the sausages. Throw a couple of sprigs of rosemary into the batter. Put the tin back in the oven carefully, and close the door. Do not open it for at least 20 minutes, as Yorkshire puddings can be a bit temperamental when rising. Remove from the oven when golden and crisps. Peel and slice the red onions and garlic, and fry off in the butter on a medium heat for about 5 minutes until they go sweet and translucent. Add the balsamic vinegar and allow it to cook down by half. Add the stock cube in, and a little water. Allow to simmer and your onion gravy is ready. Serve warm at the table, with a green salad as a side.